Tutankhamun was the young Pharaoh who succeeded Akhenaten towards the end of the 18th Dynasty. During his nine year rule he restored Thebes as the capital and started the restoration of the worship of Amon. Apart from this all we know of him is that he met a sudden end. Egyptologists did not seem worried that his tomb had never been found. If there were a tomb, they reasoned, it would probably be poor in content. In any case the notable American archeologist Davis had said that the Valley of the Kings had long since yielded all that it had to yield. Howard Carter, working for Lord Carnarvon, the wealthy Englishman with a passion for ancient Egypt, thought otherwise. He was convinced not only that there was a tomb but that there was a great possibility of its being intact. Carter, in charge of the team, toiled year after year in the desert of the necropolis. For these two, one fruitless year merely built up hope for the next. After six seasons, during which time it was estimated that some 200,000 tons of rubble were moved, Howard Carter was finally forced to accept the fact that his predecessor had probably been right and that the valley had no tomb to yield. It was a depressing decision and one that he could not bring himself to take. For there was one last, very remote possibility: the site immediately beneath the tomb of Ramses VI. It was covered with roughly-constructed workmen’s huts. On instructions from Carter his men set about demolishing them. It was 1922. At the bottom of the steps was the doorway of a tomb. As yet it was too early to tell whose, but the seals seemed intact. Cables were sent to Lord Carnarvon in England while preparations were made for the opening. Whatever had been expected, or hoped for, there is no doubt that the tomb’s actual contents surpassed the wildest dreams. When we gaze at the contents which now lie in Cairo Museum we can almost reel the agony of suspense, exhilaration and utter amazement that must have overwhelmed the first to see the fabulous treasures. The opening was attended by Lord Carnarvon himself who unhappily never lived to see the full richness of the contents of the tomb, as well Lady Evelyn Herbert, Professor Breasted and Dr Alan Gardiner. The tomb proved to be small, but packed to bursting with furniture, emblems, utensils, ornaments, bows, arrows and walking-sticks. Comforts for the Pharaoh in the hereafter included a flywhisk trimmed with ostrich feathers and a camp-bed folded in three parts. There were necklets, pendants, rings and ear-rings, to say nothing of the shrines and sarcophagi. According to Carter who spent ten years cataloguing the contents, there were 171 objects in the first room alone. When he had made a small opening in the door of the tomb chamber, he had been faced with what appeared to be a wall of solid gold. It turned out to be an enormous gilded shrine within which, one after another, lay no less than three others. Within these were a stone sarcophagus and three mummy coffins The one holding the Pharaoh’s remains was in solid gold and alone weighed 2,488.8 lbs (1128.9 Kg). Whilst the world press was focussed on Thebes it was not surprising that one imaginative journalist should attribute the death of Lord Carnarvon to ‘The Pharaoh’s curse a sting from a mosquito entombed for centuries’. It added spice to an already fermenting excitement and a growing tourist trade. Vendors and photographers had a heyday in the sacred valley, while forgers were turning out ‘antiquities’ wholesale. The mummy was found to be resplendent in gold, with a solid gold mask on the head. There were bracelets, chains, collars, gold beads and necklets of precious and semi-precious stones, engraved scarabs and garlands of flowers. Only the outer mummy case, which contains the Pharaoh’s mummy, has been left on site. The rest are in the Cairo Museum. But it is as well to bear these treasures in mind as we enter this, the smallest tomb in the Valley of the Kings, for the walls of the first chamber (Plan 16 A) which measure a mere eight by four metres, are shockingly bare. Bare, too, are the walls of the small annex (B) which contained vessels and containers for oils, baskets of fruit and seed, wine jars and pottery, all decorated in alabaster, ebony, turquoise, gold, lapis-lazuli and ivory. The only chamber with decorated walls is the burial chamber itself (C). The paintings are in almost perfect condition. The religious scenes and inscriptions retain the vivid colour of the day they were painted. There are full-length figures on three of the walls standing beneath a dark band which represents the sky. 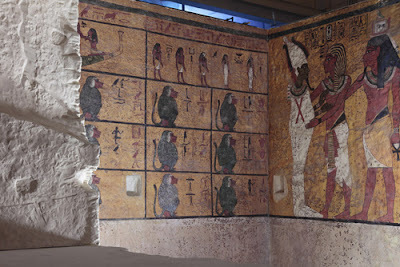 The wall on the left (a) has representations from the Book of the Dead. One is immediately struck by the proportion of the figures, which appear top-heavy. This was of course a characteristic of the Amarna period. Questions spring to the mind. Why should the walls, apart from the tomb chamber, have been so devoid of decoration when it was believed to be imperative for every stage of the journey to the underworld to be faithfully followed? Why were the contents placed in the disorder indicated in the photographs taken just after the opening of the tomb? And how could so vast an array of splendid provisions have been completed in the short span of nine years during which the boy-king ruled? Would a young monarch have been anything but sure that time was in his favour? The provisions for the hereafter can be easily explained. Tutankhamun was the last in the family line and his tomb was filled not merely with his own but with family treasures. Many of the pieces had been taken from the royal temples of Tel el Amarna. The priceless royal throne in Cairo Museum, for example, shows the young king being anointed by his wife against a background of the life-giving Aten, symbol of his father-in-law’s heresy. So even though Tutankhamun had completely renounced the teachings of Akhenaten he carried his symbols to his grave. Many of the glazed vases and sceptres clearly originated in the other capital. In addition some of the funerary objects were proved to have been made, not for Tutankhamun, but for Semenkare, Akhenaten’s son-in-law and coregent. These included one of the larger shrines, some of the mummy ornaments and the miniature canopic coffins which had for some reason been usurped and used in Tutankhamun’s tomb. The disorder is undoubtedly indicative of hurry, as is the lack of decoration on the tomb walls. It is clear that the young king met a sudden death and was buried in haste. Murder? Suicide? Until 1969 the mummy revealed no secrets. But the results of an anthropological and skeletal examination of the Pharaoh’s mummy, carried out by the Departments of Anatomy of Cairo and Liverpool Universities, are now at hand and it appears that death could have been caused by a blow on the head. Nearly half a century ago Howard Carter had said that there was a ‘scab’ on the Pharaoh’s head. Now Professor Harrison of Liverpool University claims that the unusual thinness of the outer skull of the mummy could have resulted from a haemorrhage beneath the membranes overlying the brain. The X- ray examination has ruled out the theory that Tutankhamun died of tuberculosis. If the young Pharaoh proves to have been murdered after all, it raises another question. Who was guilty? Was it his tutor Ay, who coveted his young wife and probably married her after Tutankhamun’s death? Or was it General Haremhab who had designs on the throne and actually succeeded in seizing it from the blue-bloods at the beginning of the 19th Dynasty?